Win an $80 Gift Certificate to Mercadito! Congratulations to Kurt Hoffmann on winning our twenty eigth High Five Giveaway and thank you to all who entered! 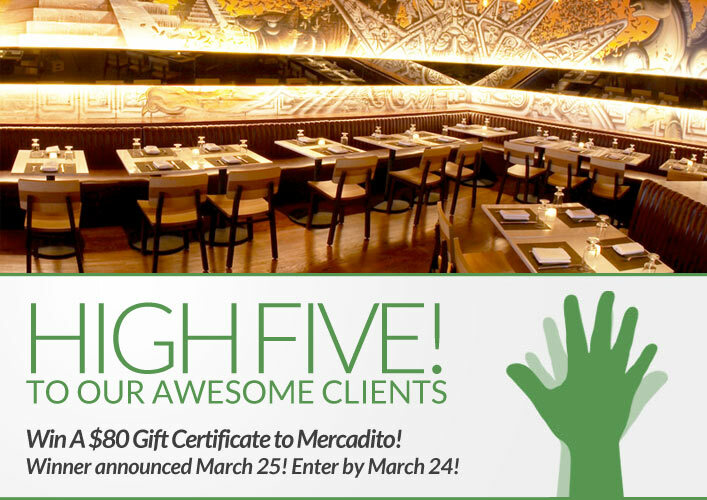 Our next High Five Giveaway is for an $80 gift certificate to Mercadito. It is also valid at Tavernita, Barcito, Double A, Little Market Brasserie and Mercadito Hospitality. Expertly blending traditional Mexico with creative interpretations of local and seasonal ingredients is the inspiration behind Mercadito restaurants. Spanish for “little market”, Mercadito is modeled after the markets chef Patricio Sandoval shopped at while growing up in his native Mexico. His muse is the cuisine of the southern region but when mixed with his own style he creates authentic dishes with an added flair. Mercadito is located at 108 W Kinzie. Visit their website at www.mercaditorestaurants.com/chicago. Click here for the Tavernita website, here for Double A’s website, here for the Little Market Brasserie website, here for the Barcito website, and here for the Mercadito Hospitality website. Now, just add a comment to this post with the right answer to be eligible to win! The winner will be announced on Monday, March 25. Entries must be received by midnight on Sunday, March 24. Good luck! Agua de Horchata = Rice sweetened fresh drink sprinkled with cinnamon powder. Blue moon with a shot of Chambord & don’t forget the orange slice! Its a Dr Pepper with Captain Morgan rum… finished off with a long spear of pineapple. Yumm! It’s a three-way tie between Mojito, Caipirinha, and a Margarita with Chinoco Reposado Tequila On the Rocks!